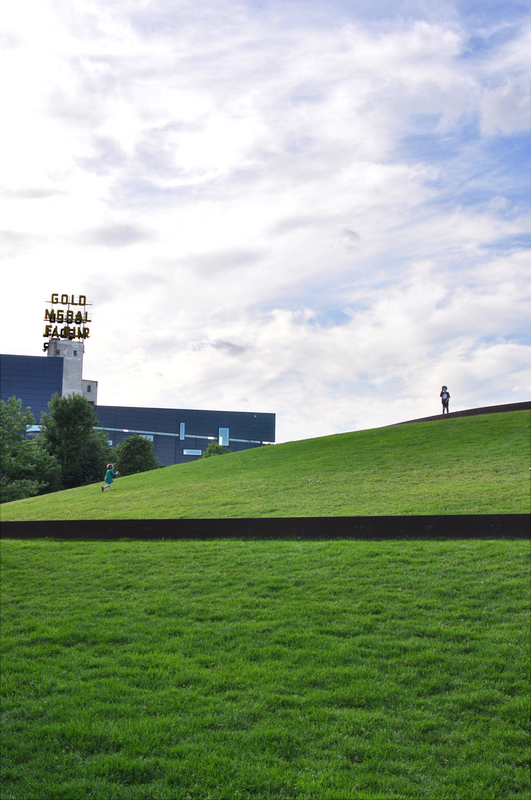 Walker Art Center & Sculpture Garden– A safe place for unsafe ideas. Walk the galleries, walk the sculpture park, or drop in for Free First Saturdays with all the many family activities to keep everyone moving and making and excited about what art can mean. Guthrie Theater– There are last minute tickets available for most shows, but even if you don’t feel ready to sit through a performance, the Guthrie building never disappoints. 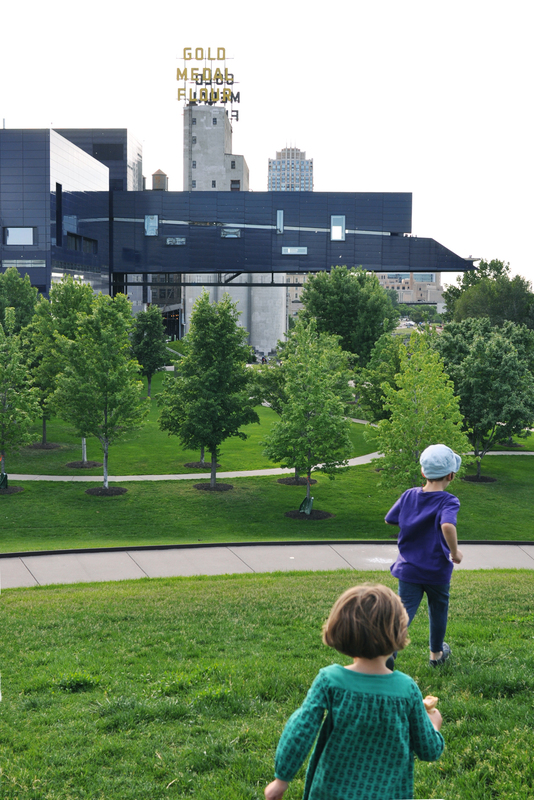 The Building is open to the public and it’s a perfect place to explore with many unexpected spaces offering unparalleled views of Minneapolis and the Mississippi river. 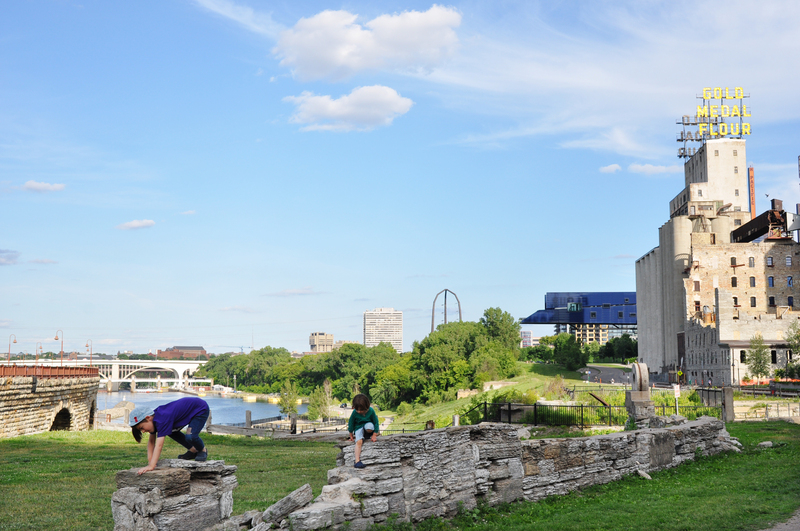 Mill Museum and Ruins– When I moved to Minneapolis 15 years ago, the waterfront was all dilapidated mill and factory buildings. In a relatively short time this area has been transformed into one of my favorite parts of the city. What was the ruins of largest flour mill in the world became the Mill City Museum. The Ruins lead out to the river and the Stone arch bridge making it perfectly balanced day of inside and out- history and fun. Minnehaha Falls– Right in the middle of south Minneapolis is a huge waterfall. Order Fish Tacos at Seasalt, rent a petal car and tour the park, or walk down the old limestone steps to the foot of the falls and go exploring on one of the paths that lead you along the creek and away from the crowds. Como Park Conservatory– This place is a breath of fresh air- warm hydrated air I might add- especially in the middle of winter. Take in all the greenery, koi ponds, serene fern room, and all of the blooms here as an escape from what ever the Minnesota weather is dishing up outside. Target Field– I’m not a huge sports fan, but the new Twins Stadium is flat out a good time. Watch the game and eat great food all in the heart of the city – who wouldn’t love that? Surly: This amazing complex of a brewery is more than the sum of its parts: great food, great beer, inside and outside settings, room to roam or hunker down. There aren’t many places that so seamlessly mix kids and booze, but this place nails it on all fronts. Punch Pizza: Quick, delicious, inexpensive and with multiple locations around the city- need is day more? Bachelor Farmer Cafe: Good taste abounds at the Bachelor Farmer. Stop in for something at the cafe, or make reservations for a very nice evening out. And if you’re really going for it, sneak down for a fantastic cocktail in the tucked away bar downstairs with your sweetheart. Brasa: Family style is the name of the game at Brasa. Pulled pork, rotisserie chicken, collared greens, black eyed peas, yams… the list goes on. Minneapolis Food Coops– Yes, the map that just came up is correct- We have over 10 coop grocery stores in Minneapolis and St. Paul which means no matter where you are really good food is close by. I may be bias, living so close to the Seward Coop and going their nearly daily, but I love our coops and visit them for groceries, skin care products, good coffee, and a quick and easy meal. but I know that food tells you a lot about a place and I think the places where many people get their food in minneapolis is very indicative of what this place is all about. We celebrate our seasons and eat our way through all of them. Most have a coffee stand, juice bar, hot and cold prepared foods and best of all, any of these locations is the perfect place to get your picnic lunch for any of the many many parks near by. Mille– There is certainly a makers movement happening all over the world, but when it comes to small makers and fashion Mille is a bright spot in South Minneapolis that brings some of the most beautiful clothing being made today under one roof. Largely an online retailer, it’s worth making it in durning open hours to smell the perfume, try on the clothing, ogle the shoes, and come away with something very special for yourself. Mill City Farmers Market– Local food, crafts people, food trucks, and flowers- We like to stop in for a coffee and baked goods in the summer and sit outside to people watch along the Mississippi. Hunt and Gather– For an altogether unusual experience in a vintage shop, with an ever changing displays and a quick turnover of items, this place is unlike any other “antique mall” I’ve encountered. It begs for a whole new label. Wild Rumpus Books– This place is magic: the little kid sized door within the big door is just the beginning. There’s a pet chicken that wanders the store… and a cat, some reptiles, and rodents tucked into their environments. Did I mention it’s a book store? And a really good one at that. The Lakes- Summer or Winter the lakes here are lovely. Nearly all of them have walking paths that loop around and public beaches or skating spots. My favorite swimming spots are on Cedar, but for biking and walking try Calhoun, Nokomis, or Harriet which all have a place to stop and get a delicious snack along the way in summer. Bikes- Nice Ride– One of the best biking cities in the country with more designated bike lanes than any place else in the US, Minneapolis is a bike friendly place. It’s a great way to get around and with stations all around the city you can return your bike to any of the stations when you’ve found a destination. Japanese Peace Garden at Lake Harriet– Summers are short but the gardens here are still lovely. Bring a lunch, a ball, a blanket and kick back for the afternoon. Aloft– This is a straightforward place to sleep. I like the location, it’s clean, it has a pool, and it puts you in walking distance to some great things downtown, and the light-rail. The Depot: with an indoor Skating Rink, Water Slide and Pool, any kid would get excited about this place, but this renovated Train Depot is properly grown up with all the amenities so it doesn’t concede the hotel completely to the kids. VRBO/Air B&B- Part of this cities charm is just how many lakes, parks, and the river and creek are scattered in our neighborhoods. Staying amongst locals would be my favorite way to see Minneapolis with a family. 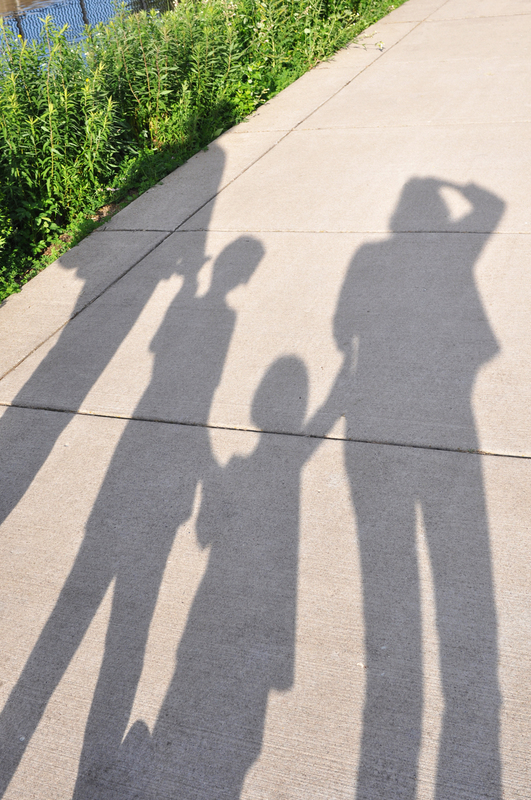 Look for places near the Lakes: Isles, Cedar, Calhoun, Nokomis, Harriet or along Minnehaha Creek or the Mississippi. Hotel at Cafe Alma -Coming Soon- One of the cities best restaurants will soon be opening a cozy hotel in the same building. This promises to be a fantastic place to rest your weary head. Nailed it! My adopted city too, it surprices you with how much is here in the middle of the prairie! Great list! The Twin Cities are also our adopted home now as well. You really could spend over a week just exploring all of the different neighborhoods here. We also love pastries from Rustica Bakery, Isles Bun and Pastisserie 46, walks around Lake Harriet (which has a large swimming beach), drinks at Summit Brewery, falafels from Mims and Holy Land Deli, brunch at the Kenwood, Sun Street Breads, French Meadow and Colossal Cafe, concerts at First Avenue and the Varsity Theater, shopping at Red Balloon Bookstore and Patina, visiting the apple orchards and the State Fair, and so much more! What a great list! The Twin Cities are also our adopted home and there is so much to do – you could really spend a week exploring all of the different neighborhoods. We love walking around Lake Harriet and the U-M Campus, Falafel from Mim’s Cafe and Holy Land Deli, Brunch at Sun Street Breads, French Meadow, Colossal Cafe, and the Kenwood, drinks at Summit and Young Joni’s back (secret!) bar, visiting the apple orchards, the State fair, and so much more!